← Making AAC in the Classroom Work! In our ever changing world of technology, it is ALWAYS exciting to see something that we already love, just get better and better…. This is the case with BOARDMAKER ONLINE. Boardmaker continues to be one of the most commonly used and popular software programs in Australian and New Zealand schools and centres. Even parents all over Australia use Boardmaker to make customised communication and learning materials for their children. Guess what? With Boardmaker Online, Boardmaker is getting better. (“What?” you say – Is this even possible!?!) 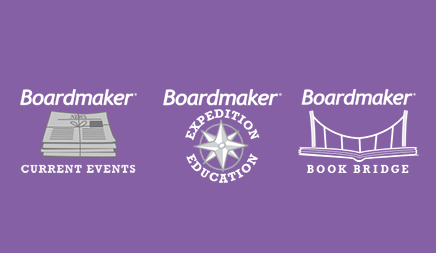 Here at Spectronics, we are excited to bring you Boardmaker Online and we know you will all be keen to jump on board this new Boardmaker era. 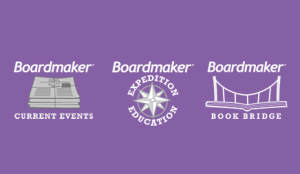 I recently read this article about the history and timeline of Boardmaker, and it certainly reminded me of me own journey using Boardmaker. When I started my career over 18 years ago, I had an old folder of PCS symbols, which I would photocopy page by page, before cutting and pasting to create my materials. It was not long until I was delivered those 4 floppy disks to load Boardmaker onto my computer and so begin my long relationship with developing Boardmaker activities on a computer. Back in those days, I only had a black and white printer and I would spend hours every week hand-colouring and then laminating resources! Step forward again and I finally got a colour printer, and my Boardmaker on a CD; with an easy to use interface, I got busy creating and making colour Boardmaker communication and learning materials. And things haven’t changed… not a day goes by that I don’t open, edit, make and then print an activity in Boardmaker. I sit so comfortably in this world…. am I ready to jump on board? Am I ready to launch into Boardmaker Online? OF COURSE!!!!! Because it will let me do things I haven’t been able to do before! 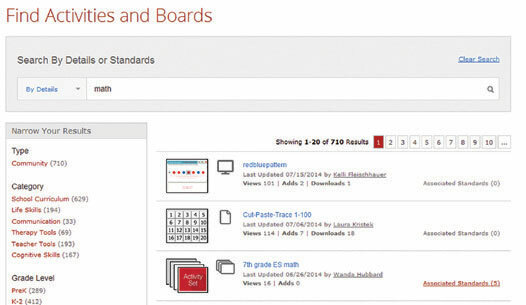 Find: We can continue to search and find ready-made activities from the Boardmaker Community. This online group has been around for a while, so there is a ever-growing collection of activities which we can access easily. I love that people are so willing to share their activities; it can be so time saving for us all! Create: NO more CD to create resources! Now you jump onto the Online Editor – on any computer (Mac or PC) in any location (office, school, home) and start creating activities! No need to install anything either. All your activities are stored within your online account, so you don’t need to carry a USB stick with files from one computer to another when you create and then need to print! You can even upload any Boardmaker activity you have already created (I have 1000s! ), which can then be edited, printed, played, shared, etc. etc. within Boardmaker Online. Phew! I still use all those activities and did NOT want to have to make them again! Assign/Print: After you have made an activity, you need to decide what to do with it…. Will you print it out and have the paper copy ready to go in the classroom? Or would you like to give the activity to a student to play/complete onscreen or on a device? Printing is super easy and is done right from the web browser. I still think there is value in printing and laminating resources for a classroom, it just depends on the task and what you are trying to do. 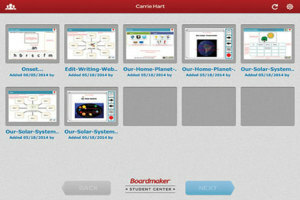 Any activity created in Boardmaker Online can be assigned to a student/group of students to use at school or at home. Once assigned to a student, it can be loaded onto the interactive whiteboard, or even onto an iPad (more about this exciting development soon!) for the student to play. 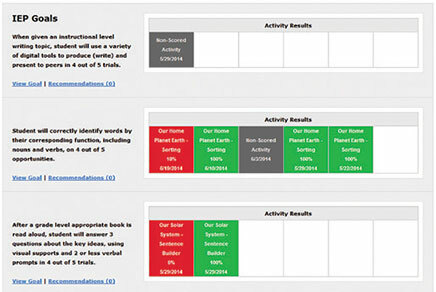 Play: Boardmaker Online has SO many interactive onscreen activity templates. Like LOTS. These templates allow you to create interative activities, books, games and resources that students can play… no printing required… that’s us saving trees! And remember that there are also many ready-made activities that you can download for students to play as well. Students and instructors can play these activities from any Windows or Mac computer, or from an iPad with the Student Center App , available for free from the iTunes app store. Students can even play activities from home! Track: What is cool and exciting, is that now, with students playing activities on their computer or iPad, it means that data can be tracked. As they do an activity, their responses can be recorded and instantly you are collecting valuable data to track a student’s progress! 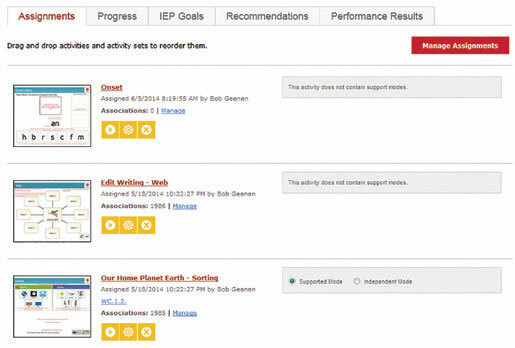 These can be linked easily to IEP goals or any goal set by you! 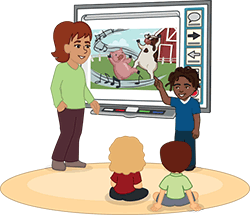 Teach: There are many ready-made educational solutions that have been developed as a part of Boardmaker Online. These are valuable add-ons that can really help students to engage in awesome learning opportunities. We are hoping to work closely with the Boardmaker Online team to make sure that curriculum content can be linked back to our Australian Curriculum. What’s gonna change here in Australia? For all my years working in schools and traveling around Australia providing training, by far and away, the most common use of Boardmaker is to develop print-based materials. Awesome teachers making and printing timetable charts. Amazing parents making and printing choice cards. Speechies making and printing communication boards and books. Oh, and about a THOUSAND other uses. Well…. Boardmaker Online is going to change this in Australia! I see huge change in the area of onscreen activities. 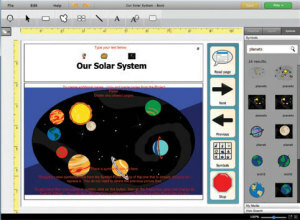 Teachers, parents and classrooms are going to LOVE how easy it is to create onscreen interactive activities. 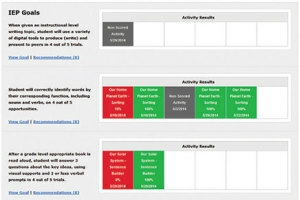 Or better still, find a ready-made activity on the Boardmaker Community and use that! Suddenly with a click of a button, an activity is assigned to a student and the student is playing it! Remember they can play it on a computer, or even on the class interactive whiteboard, or even on their iPad. Did you see how we bypassed the whole “printing-cutting-laminating-velcroing” step of the activity??? This is exciting and here at Spectronics, I cannot wait to show this part of Boardmaker Online! And I especially love that I can use Boardmaker Online offline too…. And I know you will all be pleased about that, given how reliable internet may or may not be in schools. Any activities I create in Boardmaker Online, can be downloaded onto my computer hard drive so they can be viewed offline. I also can “Print” an activity, and then print or save it as a PDF file, again so it can be viewed on my computer if I am not online. But one of the coolest things, is how Boardmaker Online interacts with the iPad app. Once you have logged in, the student/instructor activities are downloaded into the app. This part of the step requires internet. But once its done, you can go “offline” or out of the wifi range and students can still play/use their Boardmaker activities on the iPad. With so many iPads in classrooms around Australia, Boardmaker activities on iPads is going to be so useful and practical. You are going to want to do this!!!! I get to ditch the CD! The Online editor already has SO many symbols….. and guess what? NEW symbols are added every 2 weeks. Squeal!!!! No more addendum libraries to load, just instant access to the latest and greatest symbols. Bringing in photos and other images is so easy. All my existing activities can be uploaded and used. I can use Boardmaker activities on my iPAD!!!!!!!!!!!!!!!!!!!! I am saving trees. And I am saving myself hours of resource preparation, not to mention saving my hand from dreaded cutting RSI. I can keep data about how the student is progressing. I can add my students and give them homework to do. Easy access to ready-made awesome stuff. I can still print whenever I want. With the “District”-based subscription, it is really easy to share resources between members of my organisation. And probably more reasons that I haven’t even discovered yet! Oh… I think you need a teaser….. So here is a super-quick video to give you a quick taste of Boardmaker Online. But watch this space, the Spectronics team is working on loads more training videos, workshops and programs. 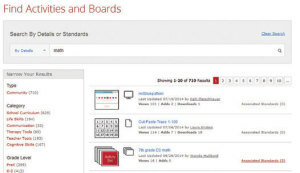 2 Responses to Boardmaker Online – Jump on board! Thanks for this teaser video. It looks great and so much easier than the previous versions. I think I will give the trial version a go – as I am a parent user.